The difference between a lady and a flower girl is not the way she behaves, but the way she is treated. I was so sad to lose my dear friend Linn Mills in 2014. I still think of him often. He made a great difference in my life, was my biggest cheerleader as we worked together daily for more than six years. 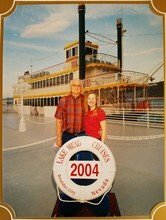 The day I started work at Las Vegas Valley Water District in March 1998, I met Linn, though I knew of him and had seen him with my Dad at our home years before. Linn knew my parents, and he knew I had a degree from BYU. Knowing only that about me, he immediately assumed I was the greatest thing since sliced bread. And so I tried to be. but the way she is treated. Linn and I spent hours together nearly every day in our work, including many outings and field trips and speaking engagements where I drove and he regaled me with tales. (The couple of times he drove me in his car, I learned he was a crazy driver!) We were “partners in crime” through many endeavors. I learned much from him, though he always gave me the credit and accolades for the success of our work. I learned how to deal with difficult people, about gardening and landscaping, about his devotion to the Savior, and about life priorities by how he spent his time. He never preached to me– instead he made me feel like I was already doing everything just right. And so I tried ever harder. Linn always said, “You’re so great, Hil. You do so good.” And, “Hil, you have more talent in one little finger than the rest of us have in our whole bodies.” He thought I could do anything and everything. So I tried to live up to the potential he saw in me. I have since learned that Linn treated everyone that way. He did the work of the Savior on the earth, and I rejoice to know he continues it now on the other side of the veil, though I miss having this giant of a man still with us. I look forward to a hug from those big strong arms again someday. Linn Mills left a legacy larger than life. What legacy will you leave?